As we get ready to celebrate Thanksgiving with our friends and loved ones, the Spinsters of San Francisco (SOSF) want to take a moment to share what we are thankful for this year: our nonprofit partner La Cocina. La Cocina is a nonprofit business incubator working with talented, working class food entrepreneurs who are predominantly women from communities of color and immigrant communities. SOSF could not be more thankful for the opportunity to support a nonprofit that closely aligns with our core value, empowering women. 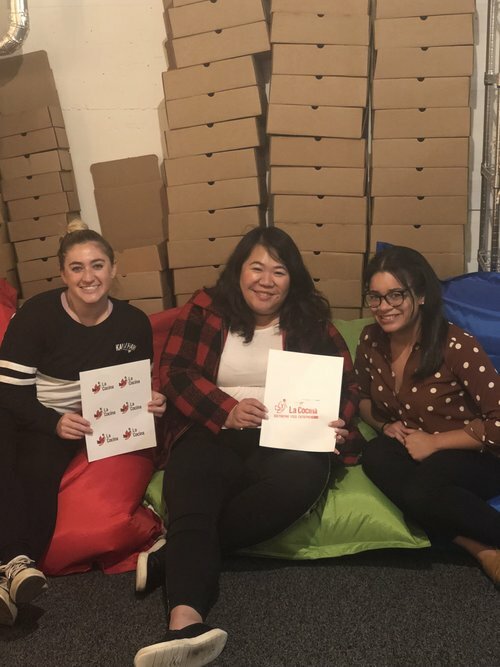 In addition to volunteering at fun-filled La Cocina events and tasting dishes from La Cocina’s chefs, our partnership has also provided a unique opportunity for members of SOSF to grow individually through 1:1 volunteer to entrepreneur matches. Through La Cocina’s 1:1 mentorship volunteering program, Spinsters are able to contribute their professional skills to aspiring food entrepreneurs as they develop their businesses concepts. As Thanksgiving is often a time to reflect on the past year, we’d like to share some of our favorite moments volunteering with La Cocina. First up, La Cocina’s annual Street Food Festival. Did you know that each year, 30+ of the Bay Area’s most talented food entrepreneurs gather on one day to showcase the most delicious array of dishes in the largest street food fest in San Francisco? At the festival, Spinsters got the chance to meet and support the talented entrepreneurs La Cocina serves (and try several delicious dishes throughout the day!). The event celebrated and promoted women, immigrant and POC-owned food businesses. Spinsters showed up in full force to volunteer as La Cocina brand ambassadors, soliciting donations and getting our hands dirty in everything from pre-event set-up, to working the bar and breaking down at the end of the event. The chefs’ passion for their food was contagious. And the FOOD! From true southern style fried chicken to nepalese momo dumplings to arabic flatbreads to boozy cheesecake, Spinsters left with hearts (and stomachs) full, grateful to take part in the festival. Our second volunteer opportunity was at La Cocina’s F&B: Voices from the Kitchen. This event provided a platform for La Cocina Chefs to tell their own stories live on stage alongside some of the food industry’s most beloved and respected writers and chefs. Not only did Spinsters have the chance to listen to incredible stories, but the event also included a roaming cocktail hour that featured delicious bites from the chefs of La Cocina. In addition to acquainting ourselves with the different La Cocina chefs, Spinsters could be found checking in attendees, sharing information on how to become a La Cocina member, and testing out our bartending skills. “From my first introduction to the Spinsters volunteer network, I knew we were in for an exciting year ahead. Every Spinster I’ve met has been full of energy, kindness and an eagerness to make her community a better place. La Cocina is grateful for the opportunity to leverage the support of this talented group of women in service of greater equity and economic opportunity for everyone,” says La Cocina’s Development and Communications Manager, Jessica Mataka. Coming up next, Spinsters and La Cocina will put on our elf hats to take on the holidays by assembling La Cocina’s holiday gift boxes and helping run their annual Tamalada, a tamale making class where guests leave with tamales to bring home to share with their families over the holidays. Interested in purchasing a La Cocina Gift Box for a loved one? Check out their gift box options ranging from $35-$100 on their online store. 100% of your purchase supports the growth of immigrant and women-owned businesses. We can’t wait to see all that is in store for our partnership in 2019 (like our upcoming Legacy Benefit fundraiser for La Cocina at the Fairmont on February 23rd!) and we look forward to sharing those moments with you. Wishing you and yours a very happy and healthy holiday season from all the women of Spinsters of San Francisco. Psst, interested in supporting La Cocina? Get involved by signing up to become a member, purchasing a La Cocina gift box for friends and family over the holidays or signing up to volunteer 1:1 with a La Cocina business owner!